Torrential rain at your Mexico destination wedding? 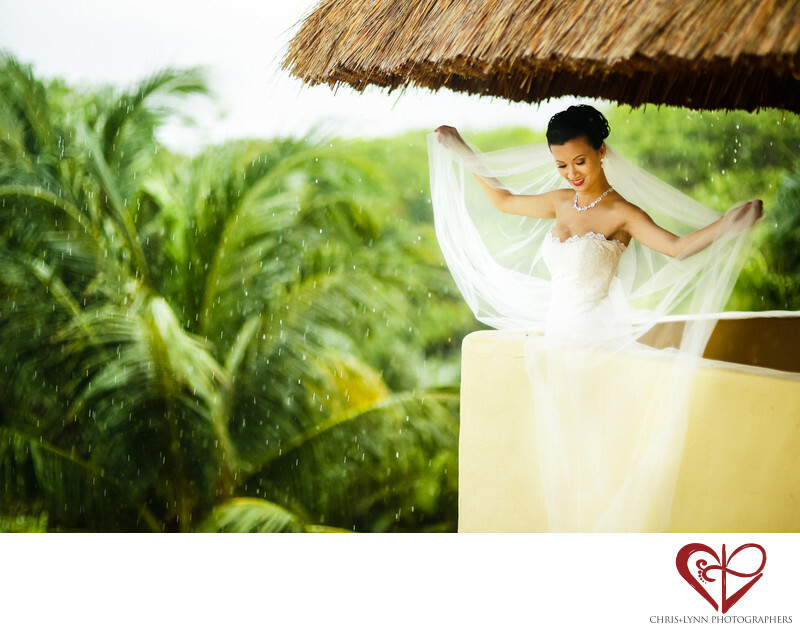 While it's not normal, it's definitely not entirely unusual if having your wedding in the Mayan Riviera during tropical storm season! But it didn't stop this bride from enjoying each and every moment of her wedding day. As wedding photographers originally from Vancouver, Canada, we are very well versed in shooting weddings in the rain! And in fact the soft lighting from the overcast skies can be very flattering. This portrait was taken under the palapa awning of the bride's Zoetry Resort hotel room before she walked down the pier to say her vows over the ocean. The palm trees and rain drops give such a sense of place to this image and her happiness - despite the weather - shines through. Zoëtry Paraiso de la Bonita Riviera Maya is one of the top locations in the Mayan Riviera for destination weddings. Set along 14 oceanfront acres on the Caribbean coast 33 kilometers south of Cancun, this high-end, all-inclusive resort is one of the most peaceful & secluded wedding venues near Cancun, Puerto Morelos and Playa del Carmen. The resort's thatched palm frond roofs and hand carved wood beams reference traditional Mayan architecture and provide just the right amount of tropical chic for a relaxed Riviera Maya destination wedding. Location: Zoëtry Paraiso de la Bonita Riviera Maya, Carretera Cancun-Chetumal Km 328, Bahía Petempich, Benito Juarez, 77580 Puerto Morelos, QROO, Mexico. 1/320; f/1.4; ISO 800; 85.0 mm.